Finalist at the 54th Besançon International Competition for Young Conductors, the chilean Helmuth Reichel Silva is rapidly gaining international attention as one of the most talented and interesting young conductors of South America. 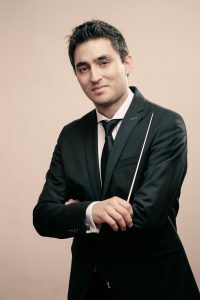 He is also the winner of the 2nd Prize at the 6th German Conducting Competition in Stuttgart and Orchestra Prize at the Jeunesses Musicales Conducting Competition Bucharest. In the season 2017/2018 Helmuth Reichel Silva will make his Japan debut with the Tokyo Symphony Orchestra at the Muza Kawasaki Symphony Hall and with the Orchestra Ensemble Kanazawa at the Ishikawa Ongakudo Concert Hall. Furthermore, he will make his China debut conducting the Young Philharmonic Orchestra of Baden-Württemberg on tour in Shanghai. Other engagements include the Sinfonieorchester Villingen-Schwenningen, Orquesta Sinfónica Nacional de Chile, Orquesta de Cámara de Chile, Orquesta Clásica de la Universidad de Santiago, Orquesta Sinfónica de La Serena, Orquesta Sinfónica de Antofagasta and Orquesta Sinfónica de Concepción. Following his critically acclaimed debut concert with the Orquesta Sinfónica Nacional de Chile in 2016, Helmuth Reichel Silva was immediately given an invitation to return as Conductor in Residence at the orchestra’s annual Summer Concert Series, featuring his debut at one of the most important festivals of South America, the “Semanas Musicales de Frutillar 2017” at the “Teatro del Lago”. Helmuth Reichel Silva has conducted orchestras such as the SWR Stuttgart Radio Symphony, Sinfonieorchester Basel, Orchestre Victor Hugo Franche-Comté, Stuttgarter Philharmoniker, Stuttgarter Kammerorchester, Orchestra di Padova e del Veneto, Oltenia Filarmonica, Georg Enescu Philharmonic, Kammerphilharmonie Graubünden, Württembergische Philharmonie Reutlingen and Südwestdeutsches Kammerorchester. He has also collaborated with the Junge Deutsche Philharmonie and the Landesjugendorchester Nordrhein-Westfalen. From 2014 until 2016 he was Chief Conductor of the Sinfonieorchester der Katholische Hochschulgemeinde Freiburg. His opera debut was in 2013 at the Schlossoper Haldenstein in Chur, Switzerland with Verdi’s ‘Rigoletto’ and the Kammerphilharmonie Graubünden. During his tenure as Principal Conductor of the Strohgäu Sinfonieorchester Schwieberdingen he performed many semi-staged operatic works by Puccini, Verdi, Mascagni and Mozart. Helmuth Reichel Silva was born in 1983 in Santiago, Chile. He started to play violin at the age of five, attending the Conservatorio Nacional de Música in Santiago, moving later to Germany in 2002. During this period he received several prizes and scholarships, such as the “Fondo Nacional de la Cultura y las Artes”. After finishing his violin studies in Würzburg with Soloist-Diploma, he joined the Stuttgarter Philharmoniker and later the Neue Philharmonie Westfalen at the Musiktheater im Revier Gelsenkirchen. During this time he was able to collect invaluable experience as an orchestra musician both in symphony and opera, working with conductors such as Mariss Jansons, Jonathan Nott, Hannu Lintu and Michael Sanderling, before going into conducting with Per Borin at the Musikhochschule Stuttgart and Sebastian Tewinkel at the Musikhochschule Trossingen, where he finished his musical training. He attended courses by Jorma Panula, Yuji Yuasa, Rodolfo Fischer, Bruno Weil and Yuuko Amanuma. Helmuth Reichel Silva was laureate of the Dirigentenpodium Baden-Württemberg Conducting Program, which gives young conductors the opportunity to work with leading orchestras in Germany.